Don’t take my word for it; Read this book. Published, April 2010. Finally I got round to reading Daniel Willingham’s ‘Why Don’t Students Like School?’ It’s been on my desk for quite a while after being recommended to me by a number of friends. It is probably the most frequently referenced book on the education blogosphere and certainly amongst the most contentious. The following blog represents my notes and thoughts, which I started on Twitter and some people have said they found useful. I have tried as much as possible to write using Willingham’s own words. It is not an interpretation of his argument, rather an outline of the main subjects and some thoughts and opinions of my own. Most, but not all, are complementary. Introduction – Willingham explains the purpose of the book is to share with educators recent developments in cognitive science. The book is divided into nine chapters, each outlining a different principle “fundamental to the mind’s operation”, which he believes can be reliably applied to classroom practice. 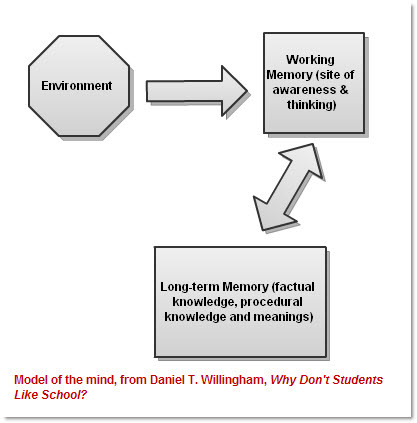 At the centre of Willingham’s narrative is a model of the mind that describes how a person’s cognitive processes involves an interaction between the environment and their Working Memory (WM), in tandem, with their Long-Term Memory (LTM). I’m not a cognitive scientist and I’m not an expert in all the most recent research in the field, however, I’m quite capable of recognising a theory when I see one and am always sceptical when I’m being asked to accept one on trust. Willingham spends very little time explaining how his model works (especially these mysterious ‘procedures’) or how scientists know the theory is robust; He basically asks us to take his word for it, however other theories are available [Ref]. Based on how little scientists actually know about how the human mind works, my view is all theories in cognitive science are extremely tenuous, and as a consequence should be considered with maximum scepticism and constantly tested by experiences in the real world: Especially those that reduce all the subtle complexity of human learning and understanding to three boxes with arrows pointing at them. However, that is not to say Willingham’s book is without merit. In fact much of it is very useful. For example, I’m interested when Willingham tells me stories are an effective and engaging medium for helping children make new meaning and remember new information. But, I’m less interested when he tells me (according to his cognitive theory) this is because children’s working memory gets overloaded. The strength of this book is that it contains good educational advice (mostly); its weakness is its constant reference to a theory in science that I find fundamentally unconvincing. Principle 1: People are naturally curious, but we are not naturally good thinkers; unless the cognitive conditions are right, we will avoid thinking. Change the pace – to grab the students’ attention. Keep a diary – for honest reflection. This is an extremely sensible list acknowledging the importance of working from where the students are while striving to plan and teach activities that challenge their cognitive limits and keep them engaged. I particularly noted the importance Willingham gives to questioning and creating opportunities for students to puzzle things out for themselves, not rushing to explain or give the answer. Throughout the book he is careful to give the central roles to both knowledge acquisition and skills development [procedural knowledge]. Principle 2: Factual knowledge must precede skill. Note Willingham is careful to include the rider, “in the context of skills”. This is a strategy he uses throughout the book, making a bold claim and then immediately qualifying his assertion, allowing him to appeal to teachers across the pedagogical spectrum. I approached this chapter in some trepidation, the principle: Factual knowledge must precede skill sounded particularly ominous. Summoning up images of Victorian classrooms and drilling facts. However, I needn’t have worried. In fact Willingham is careful to warn teachers this is not his intention, making it clear that although factual knowledge is the bedrock of learning, it is important that new knowledge is quickly used and applied in meaningful activities. Involving tasks that challenge students’ cognitive skills, engage them in exciting environments for learning and helping them make meaning. Principle 3: Memory is the residue of thought. “a student must pay attention to it [the material being learned]. Further, how the student thinks of the experience completely determines what will end up in the LTM. He then discusses one of the most interesting (for me) themes of the book, “The Power of Stories”. I’ve quoted as much as I can from this paragraph, trying to be fair to the meaning, without copying out the whole thing. You can see once again how Willingham makes a statement “Use discovery learning with care” and then immediately qualifies it, “discovery learning has much to recommend it”. What does he mean? You can see how different people have used his words to support opposing arguments: To my mind Willingham is being very sensible, putting the emphasis on learning, rather than pedagogy. I don’t see any evidence, at any point in the book, that he is promoting one teaching approach over another. There is much I like in this chapter, particularly Willingham’s advocacy of using stories to engage students and make the curriculum meaningful. I didn’t expect to see tension (conflict) and inquiry (questioning and problem-solving) given such prominence, especially within narrative structures. Great stuff. Willingham is clearly not someone who thinks education is about ‘entertaining’ (distracting) children, which is quite right. But neither is he someone who ignores the importance of engaging them and making learning meaningful and exciting. Principle 4: We understand new things in the context of things we already know, and most of what we know is concrete. This makes knowledge transfer not impossible, but very difficult in most circumstances. To help student comprehension, provide examples and ask students to compare them – provide lots of experiences, via lots of examples. Help students to think about deep structures. Make your expectations for deep knowledge realistic – deep knowledge is hard-won and is the product of much practice. This chapter made me wonder how much of the new curriculum could be characterised as developing Deep Knowledge; making ‘rich connections’ and helping students see not just the “parts, but the whole’? Over time, with practice, mental processes can become automatised, requiring little or no WM capacity. Practice the processes that need to become automatic – probably the building blocks of skills that will provide the most benefit if they are automatised. Practice works better if it’s spaced out. Fold practice into more advanced skills. Principle 6: Cognition early in training is fundamentally different from cognition late in training. This chapter demolishes learning styles and multiple intelligences. 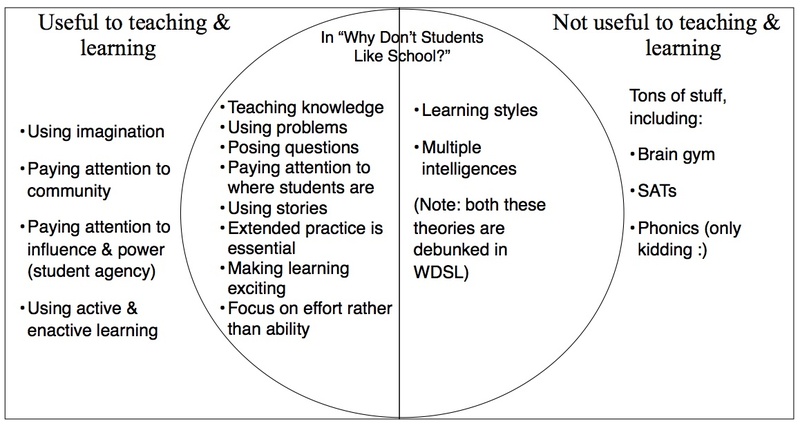 Since I don’t care for either, and never did, I’m not going to summarise Willingham’s argument, other than to say he thinks they are both wrong and teachers should use their professional judgement to differentiate and ‘scaffold’ (my word) their lessons appropriately. This chapter contains some useful advice for helping your students to think of intelligence as something they can improve through hard work and reflection. “How can we improve intelligence? After reading this chapter I thought teachers who stop practicing are not worthy of the name and need to stop telling others how to do it. As I said at the very beginning, don’t take my word for it, go and buy the book. It is a good primer for some of the fundamental elements of good teaching and learning. However, it is an incomplete picture and a bit more honesty about the status of the science would have been welcome. The role of imagination is completely ignored, except from the Einstein quote. Willingham doesn’t argue against imagination having a role in learning, he simply disregards it. It is tempting to say this is because cognitive scientists don’t currently understand the role played by imagination in learning, this is certainly the view of Kieran Egan [Ref], and it is undoubtedly a complex subject, however educators, authors and artists are well aware of its utility and don’t need to understand how it works in the human mind, to know it does. There is very little discussion about the role of community. The teaching and learning process described in the book is fundamentally a private affair between the student and their mind, influenced by the teacher. Community is always there, lurking in the shadows, but it never brought out and given a place of importance. It would be easy to read, “Why don’t students…” and not think that human relationships, communities of learning or classroom environments had anything much to do with the process. Lave & Wenger, Situated Learning [Ref]. Similarly emotions – beyond simple pleasure and engagement – are generally ignored. The question of influence and power relationships in the classroom are completely absent. Although there is a welcome acknowledgement of the use of ‘praise’ for effort over ability, this is not expanded to include analyse of intrinsic motivation and agency. For more on this subject you might want to read Alfie Kohn, ‘Punished by Rewards’ [Ref] and Devine, Children, Power and Schooling [Ref]. He also doesn’t mention ‘active’ or ‘enactive’ learning of any kind. Students are static throughout his book, apart from sports, and the learning model is entirely centred on the mind. This is not unexpected, but still an oversight. Dorothy Heathcote [Ref. ], an academic who taught in classrooms until the year she died at 86, would have had a thing or two to say about a learning theory that didn’t involve meaning making through action. Hey, actually followed you on Twitter w/o knowing about this blog post! It’s good to know I haven’t misrepresented your ideas. The question of pedagogy is hugely important and I agree entirely with your emphasis on learning. I think every teachers has had the experience of planning and teaching a lesson where everyone has had a wonderful time… and the students have learnt nothing. I’ll take a look at When Can You Trust the Experts? And the college book, although it might be hard to find. I actually followed you on Twitter bes. I saw you Twitter-debating Andrew Old. I follow Andrew and find a lot of his posts interesting, but I like to get different points of view. The Dodo verdict is new to me. Thanks Jason. For me DW’s approach to pedagogy was one of the most encouraging aspect of his book. We must be careful as a profession not to restrict our ‘palette’ for bogus ideological or scientific reasons. Thanks for this. Your venn diagram is particularly useful and interesting. I certainly like the inclusion of ‘paying attention to community’ and also the idea of student agency. Students are often capable of more than we think and they need to be given the time, trust and support to do so.